The Tigers begin a weekend series against the defending AL West division champion Texas Rangers, which makes this a really good time to pause for a moment and remember that the Rangers are a baseball team. I forget this on a regular basis, and I have no idea why. Certain teams are just perpetually sitting in my mental "blind spot." They had Nolan Ryan, who was literally inducted into the Hall of Fame as a Texas Ranger. Also some guy named "Pudge" Rodriguez. They made it to the World Series in both 2010 and 2011, and now I remember why I have them blocked from memory. Alright, but that was years ago, and this is 2016, so let's quickly review who we're dealing with this weekend (and by "we're" I mean "you, me, and the Tigers," because we're all on the same roster). The Rangers are dealing with health issues for the third straight season. Yu Darvish is still recovering from Tommy John surgery, Cole Hamels missed some time a couple weeks ago with groin issues, and no one has even seen Nolan Ryan for, like, decades. Still, they have a starting rotation that has posted more innings pitched per game than any team in their division except the Mariners, and we're talking about maybe a third of an inning's difference. Their starters average six innings per game, and give up an average of roughly 2.4 runs per game, which is best in the AL West. The key for the Tigers will be to knock out the starters early and get to the Rangers' bullpen. The relief corps, as we saw, is called on to throw an average of three innings per game, much like the Tigers are handling things currently. The Rangers' bullpen, however, strikes out less than a batter per inning, and will put an average of 4.4 runners on the bases in any given game. Those extra baserunners translate to an average of 1.7 runs per game, so if the Tigers can get into the bullpen, they should have some success. If the pitching staff as a whole is giving up around 4.1 runs per game, how are they in second place currently in the AL West? Because their offense is also second best in the division, keeping pace with the pitching staff by scoring an average of 4.1 runs per game. Their team .253 batting average is best in their division (and above the American League average of .247), but their team OPS of .696 is below the league average of .712, largely because they're only slugging .385 as a team. 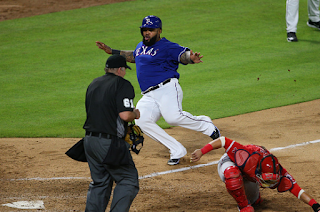 They really should sign Prince Fielder or something. The Rangers are without their regular right-fielder in Shin-Soo Choo, currently recovering from a calf strain. They are also without catcher Robinson Chirinos, so our old friend Bryan Holaday is seeing a lot of playing time so far this season. Expect to see him at some point during the weekend. Using the most basic, rudimentary, and -- quite frankly -- embarrassing mathematics possible, the Tigers project to win 51 percent of this series*, while the Rangers win 49 percent. Obviously, this is impossible, because you can't split a three-game series half-and-half. Someone has to win that middle game, and since Mike Pelfrey is pitching on Saturday, expect the Tigers to lose that game twice. At least we'll (hopefully) get to watch Prince Fielder attempt to slide a few times. *How in the blue hell do the Tigers project to win only 51 percent of these games when their offense is scoring 4.52 runs per game against the Rangers' 4.14, and their bullpen is only allowing 1.1 runs per game against the Rangers' 1.7 runs per game? That's what a good starting rotation gets you. If Rangers starters are only allowing 2.4 runs per game, Tigers starters are allowing 3.3 runs per game -- almost a full run-per-game extra, which all but negates the bullpen advantage.